Have you heard of the #TeamThomas campaign currently underway on the Thomas & Friends website and Facebook page? It is all about celebrating Thomas & Friends core values of friendship, determination and teamwork as well as a new racing theme for 2016. Each week there are fun activities that parents and children can join in with to reinforce the positive values of friendship, teamwork, participation and determination. By sharing stories, photos, videos and comments on Twitter and Instagram using #TeamThomas you can help Thomas on his journey to the Great Race, which is the new film out in a couple of weeks, and when he reaches his final destination there will be ever before seen videos and amazing prizes for Thomas fans! Little N is wearing a top from Joules and leggings from Lottie & Lysh. 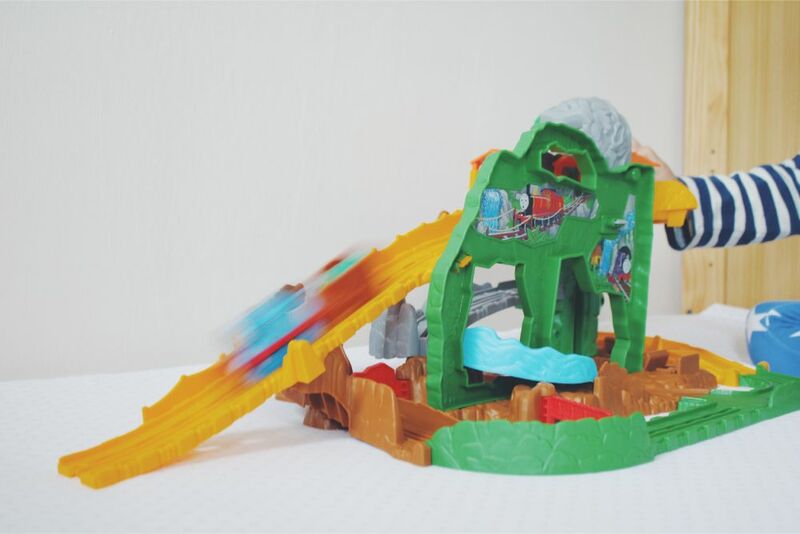 Both of my boys love playing with train sets, but they've never had a Thomas & Friends one, so when their new Thomas & Friends Take-n-Play Jungle Quest Playset arrived they were beside themselves with excitement! It's a portable, fold out playset which comes with a Thomas die cast engine and a trailer which holds emeralds. 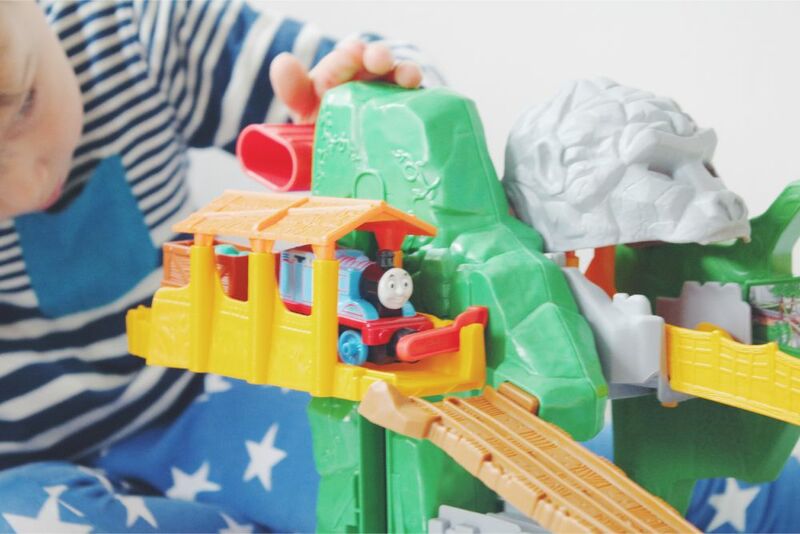 Thomas must go on a quest to retrieve the emeralds, but had to get past the gorilla guardian to do so! The playset come in several pieces with clear instructions on how to build it; it took me just a few minutes to make as the pieces slot together really easily. The playset has two sides of play. The first side is to help Thomas find the emeralds which the gorilla has hidden. Thomas goes into the first tunnel and by pushing the red lever down and up, Thomas is raised and then released down the track to chase the cart holding the treasure. The playset is then turned round to the other side. 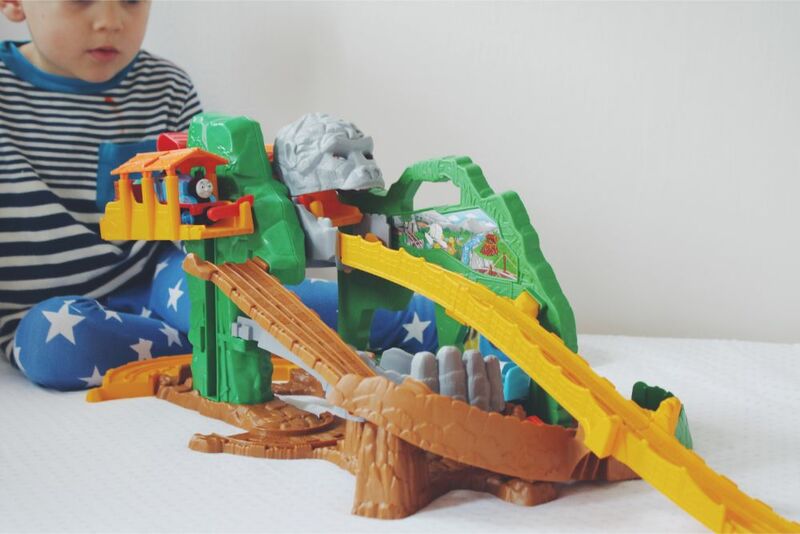 This time Thomas must take the emeralds and go into the next tunnel to go up again, through the gorilla guardian's mouth and make his escape down the rope bridge. 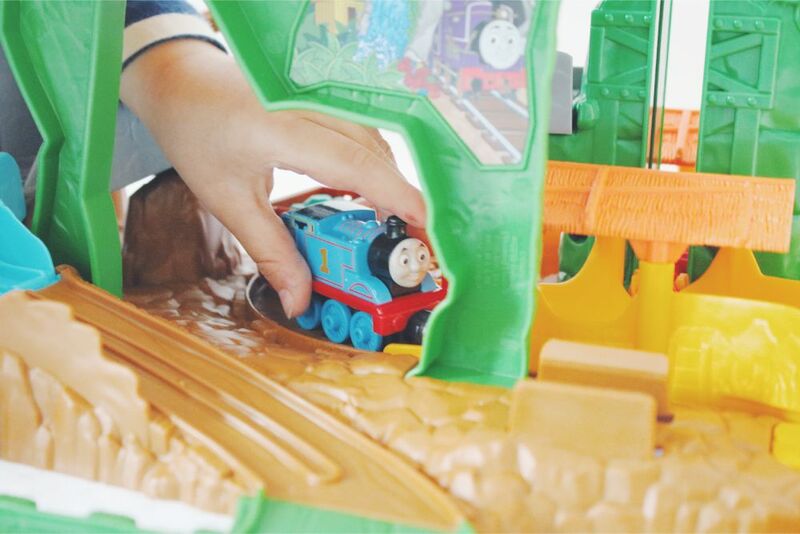 It's a lot of fun to play with and the boys love helping Thomas on his special adventure. J in particular giggles and claps with delight! I really like how portable this playset is; it has a storage slot for the Thomas engine and the cart so they don't get lost. It drives me bonkers when I can't find the right pieces for the right toys! And parts of the track can be folded up so the set can be easily carried using the handle on the top. This is really useful, not just for storing but for taking with us like today when we went to visit my dad. We're going on holiday to the Isle of Wight soon, and I think this will be one of the toys that the boys will be bringing! 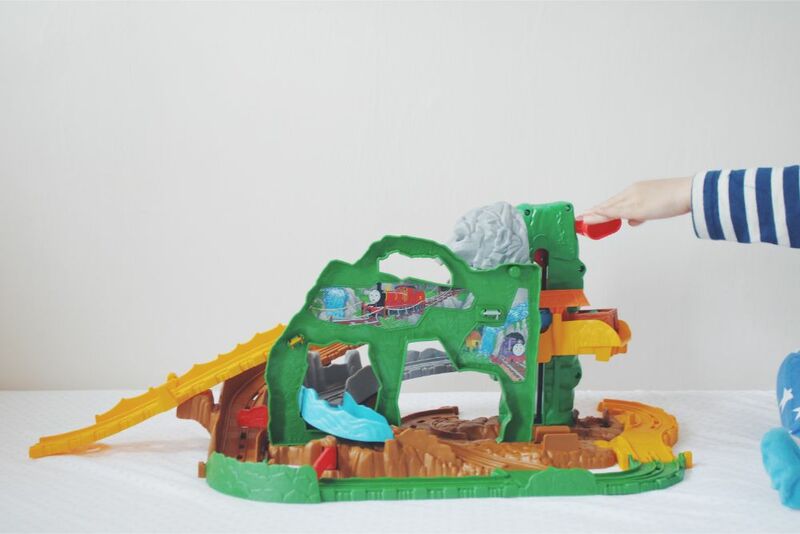 You can find this Thomas & Friends playset at Toys'r'Us and other toy stores for £27.99. Are your children joining in with #TeamThomas? I was sent the Thomas & Friends playset to review. This post contains affiliate links.